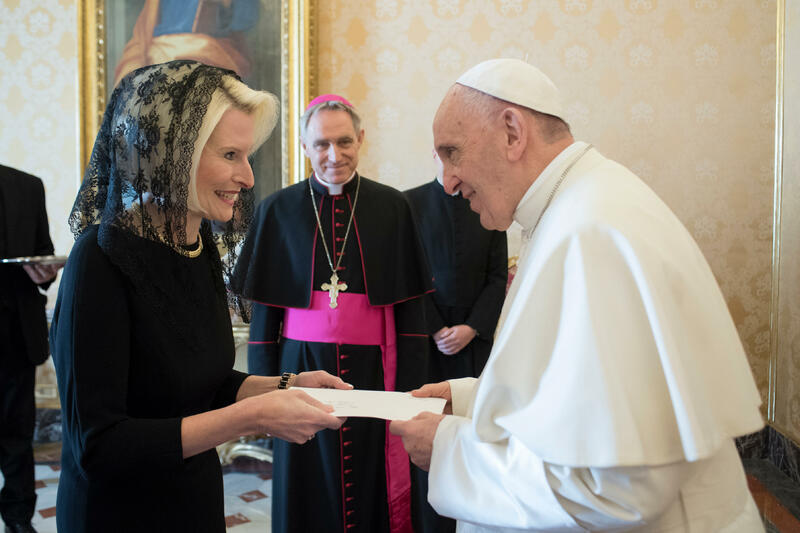 New Ambassador of the United States of America to the Holy See, Callista Gingrich, has presented her credential letters to Pope Francis, the Vatican stated this morning. In doing so, the ambassador officially assumed the duties of United States Ambassador to the Holy See. Following the encounter with the Pope, Ambassador Gingrich met with Vatican Secretary of State, Cardinal Pietro Parolin. Ambassador Gingrich is the former President and CEO of Gingrich Productions. She is the author of the “Ellis the Elephant” children’s American history series and co-author of “Rediscovering God in America.” Ms. Gingrich is also a producer of several historical documentary films. She previously served as a congressional aide in the U.S. House of Representatives, as the President of The Gingrich Foundation, and as a member of the Choir of the Basilica of the National Shrine of the Immaculate Conception in Washington, D.C. According to a statement released by the Holy See Press Office, the ambassador looks forward to working with the Holy See to defend human rights, advance religious freedom, combat human trafficking, and to seek peaceful solutions to crises around the world.